In case you missed the news, Apple unveiled their new iPhone SE and 9.7-inch iPad Pro today. This launch from Apple was just as cloak and dagger as previous launches and didn’t disappoint. As BGR noted, iPhone SE fills a much needed gap in Apple’s current line up. For anyone who wants an iPhone that has a more compact 4-inch screen, like the iPhone 5s, but with all the technical prowess of the iPhone 6s, there really hasn’t been any options, until now. Following the same form as the iPhone 5s with all the brainpower of the iPhone 6s, the iPhone SE features Apple’s A9 chip, which will make it 2x faster than the iPhone 5s with 3x the graphics performance. The other big bonus, the iPhone SE has a better battery life than the iPhone 5s and includes the same high quality 12-megapixel camera as the 6s. Looks wise, the new iPhone SE has similar aesthetics to the iPhone 6s in a smaller form with an on-trend metallic color range, including rose gold. Heavy on upgraded features with a slick design, your iPhone SE is going to need some serious protection that won’t interfere with it’s functionality. 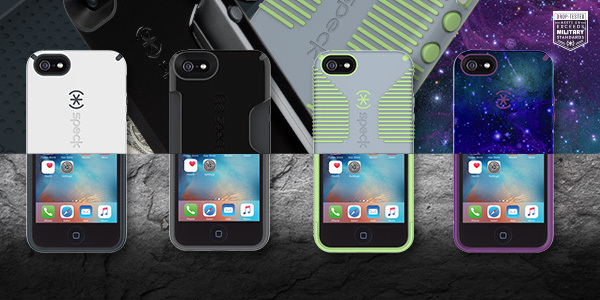 All of Speck’s slimline, durable iPhone 5/5s covers fit the iPhone SE and offer all-around, slim protection with impeccable design that compliments your device. Our CandyShell Clear case is perfect for showcasing your new iPhone SE, no matter which color you choose. Built to make an impact and take one, protect your new iPhone SE in a Speck case without worrying about the inevitable knocks, scrapes and spills of daily life. If you’re in the market for a new tablet, the new 9.7-inch iPad Pro is definitely worth checking out. As techradar says, the 9.7-inch iPad Pro is the iPad Air 3 we’ve been waiting for. By fitting all of the specs of the larger 12.9-inch iPad Pro into a frame that’s in line with the iPad Air, Apple have made a more portable iPad Pro that includes an impressive display and Apple Pencil support. With what Apple calls a True Tone display, the 9.7-inch iPad Pro can match the light around you and is also brighter and less reflective, a feature that makes readability easy in all conditions. With such a sophisticated design profile, protecting your 9.7-inch iPad Pro will no doubt be one of the first things you’ll want to do. When it comes to 9.7-inch iPad Pro cases, Speck has you covered with their sleek, durable StyleFolio, elegant StyleFolio Luxury Edition and kid friendly iGuy. Plus two new cases that perfectly fit the new 9.7-inch iPad Pro, StyleFolio Pencil and SmartShell Plus are coming in May 2016. If you’re looking for an 9.7-inch iPad Pro case that will store your Apple Pencil safely as well as protect your device, the StyleFolio Pencil is for you. On the other hand, if your preference is for a simple, slim and clear 9.7-inch iPad Pro case that elegantly protects and showcases your new 9.7-inch iPad Pro, you’re going to love the SmartShell Plus. Now you know where to find the perfect iPhone SE and 9.7-inch iPad Pro case for your brand new device. Enjoy!